First, American DJ brought tantalizing blue-colored lasers within reach of DJs, mobile entertainers and small clubs. Now the company is once again breaking new ground in color laser effects with the Ruby Royal, a revolutionary fixture that utilizes a 150mW red laser diode and a 150mW violet blue laser diode to create not only red and blue patterns, but also a third color—magenta! By combining its red and blue lasers to produce magenta, the Ruby Royal adds an exciting new color dimension to the world of laser club effects. Moving with the smoothness and precision of high-quality 1.8° stepper motors, this one-of-a-kind laser generates hypnotizing red, blue and magenta patterns that can be projected onto dance floors, walls and ceilings. Great for DJs, entertainers and dance clubs, the Ruby Royal is equipped with 20 built-in laser patterns, which make it very easy to use. Just turn it on, and the unit will run through its intense freeform-style laser patterns in Sound Active Mode, projecting over an extremely wide area. For even broader coverage, multiple Ruby Royal units can be linked together Master-Slave via 3-pin DMX cable, to create an exciting laser light show above a dance floor or on walls and ceilings. The fixture includes IEC In and Out to daisy-chain power for up to 18 units. 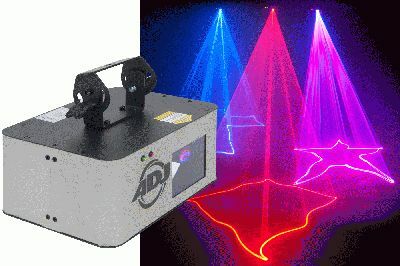 The Ruby Royal can also be operated with a DMX controller to create a custom-programmed light show. Operating on 6 DMX channels, it features a digital display with a 4-button menu on the rear panel that makes it easy to navigate through DMX settings. As another convenient control option, the Ruby Royal features a ¼-inch input for use with an optional UC3 remote controller from ADJ (sold separately). Ideal for use anywhere, the Ruby Royal’s 150mW lasers are in total compliance with FDA standards, ensuring its safety. The unit comes with its own hanging bracket and even features a special safety hook on the rear panel, so it can be easily positioned on nightclub walls or securely mounted overhead. Housed in a durable metal case, yet very compact and lightweight, the Ruby Royal is also great for mobile use by entertainers-on-the-go. It weight just 8 lbs. / 3.5 kg. and measures 10"Lv x 7.5"W x 7.5"H / 252 x 190 x 186 mm. The Ruby Royal is fan-cooled and comes with a multi-voltage power supply: AC 100-240V, 50/60Hz. Very efficient to operate, it consumes just 17 watts of electricity maximum. A convenient On/Off button is located on the unit’s rear panel. The MSRP of the Ruby Royal is $839.85.